Breast cancer is one of the most common cancers affecting women. In fact, 1 out of every 8 women will be diagnosed with invasive breast cancer in her lifetime, according to the National Cancer Institute, and at least 3.5 million American women have a history of breast cancer, according to the American Cancer Society (ACS). There are several types of breast cancer, categorized by location and aggressiveness, and further classified according to tumor size and other factors — including how the cancer responds to certain hormones. More than 80 percent of breast cancers are estrogen receptor (ER)-positive, which means the cancer growth is fueled by estrogen. Because the role of diet in breast cancer survival is not fully understood, common nutrition advice is based on what is known to prevent breast cancer — and these guidelines aren't specific to cancer type. In fact, nutrition advice for breast cancer prevention closely matches the breast cancer survivorship guidelines, published in December 2015 by the ACS and the American Society of Clinical Oncology. 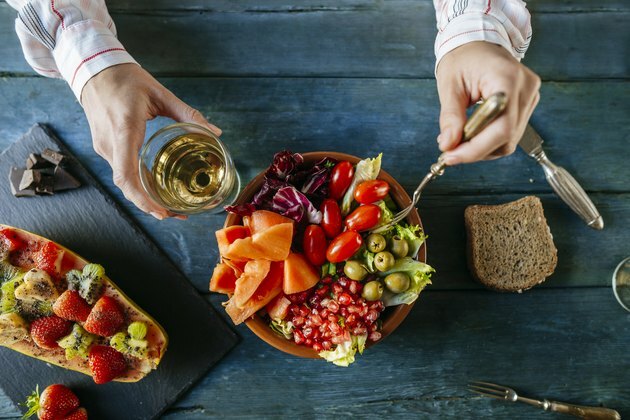 These recommendations encourage survivors to consume a diet that emphasizes vegetables, fruits, whole grains and legumes, while limiting alcohol and saturated fat. These guidelines are not specific to cancer type or ER status, although people who have estrogen-dependent cancer may respond well to these recommendations. The fiber, antioxidants and other phytonutrients in fruits and vegetables have the potential to reduce cancer growth, although research results have been mixed on their role in breast cancer. In fact, data from the Women's Healthy Eating and Living (WHEL) trial, a study of more than 3,000 women with a history of early-stage breast cancer, failed to show a diet rich in these foods reduced the rate of recurrence. However, data from the Women's Health Observational Study (WINS), a trial of nearly 94,000 postmenopausal women with a history of early-stage breast cancer, linked a higher intake of carotenoid-rich fruits and vegetables, such as leafy greens, carrots, sweet potatoes and nectarines, to a lower recurrence of ER-positive breast cancer. In addition, a 2008 study published in the Journal of Clinical Oncology of nearly 1,500 women with early-stage breast cancer found those who ate at least five daily servings of fruits and vegetables — and exercised 30 minutes daily — cut their risk of death in half over a 10-year period. This benefit was greatest among women with ER-positive breast cancer. Eating a diet rich in fruits and vegetables can do more than cut cancer risk. A plant-centered, high-fiber diet can also reduce the risk of other health problems that breast cancer patients may face, such as obesity and cardiovascular disease. Consequently, women with breast cancer are encouraged to include a variety of colorful fruits and vegetables in their daily diets. A diet that emphasizes other fiber-rich foods is also encouraged for breast cancer survivors. Choosing whole grains, such as brown rice, oatmeal or whole-wheat bread instead of refined, lower-fiber alternatives, in addition to eating more legumes, such as lentils, black-eyed peas or pinto beans, can influence cancer risk or recurrence rates through different mechanisms. A high-fiber diet has also been shown to reduce blood estrogen levels, lower the risk of obesity and decrease inflammation — all factors related to breast cancer development. 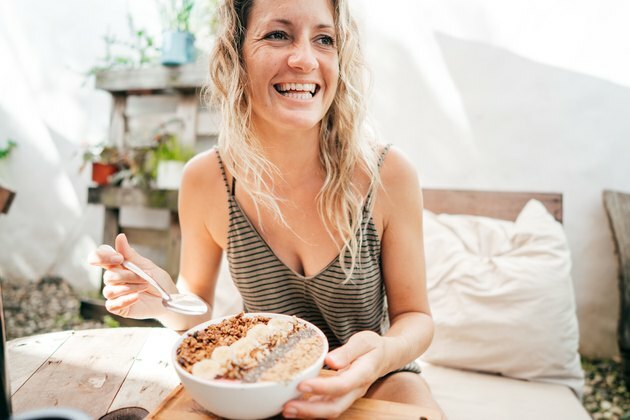 While more research will help determine how fiber affects different breast cancer types, a fiber-rich diet can cut the risk of developing breast cancer by 11 percent, according to a 2011 study published in The American Journal of Clinical Nutrition. Cancer prevention and treatment guidelines commonly recommend a low-fat diet, but research results on this connection have been inconsistent. For example, the WINS trial linked a low-fat diet to lower recurrence and greater survival rates, but these benefits were much more significant in women with ER-negative breast cancer. Instead of a focus on total fat, conclusions from a 2013 research summary direct breast cancer survivors to reduce saturated fat and incorporate more omega-3 fats into their diet. This can be accomplished by decreasing animal protein and replacing some or all animal protein with plant proteins, such as nuts, seeds, legumes and soy products. In addition, choose leaner options like fish and poultry, and reduce or avoid sausages, high-fat lunch meats and red meats, such as beef, pork or lamb. Other lower-fat choices include nonfat or low-fat milk, yogurt and cheese, or plant sources of these foods, such as fortified soy or almond milk or vegan cheese. Incorporate omega-3 fats by eating fatty fish, such as salmon or sardines, or by adding walnuts or flaxseeds to your diet. Are Soy and Flaxseeds OK? Soy contains phytoestrogens, or plant-based estrogens, which has raised concerns regarding soy's role in the development of breast cancer; however, whole soy products, such as tofu, edamame or soy milk, have been shown to reduce the risk of breast cancer, including ER-positive cancers. This plant protein is also considered a healthy choice for breast cancer survivors. In fact, a 2010 study from JAMA of more than 5,000 women living in China linked regular, whole soy intake to a reduced recurrence of all breast cancer types. However, isolated soy — found in supplements, soy powder or processed foods — should not be emphasized, as these foods have not been shown to be protective. Flaxseeds are rich in lignans, a phytoestrogen, and also a good source of omega-3 fats and dietary fiber. 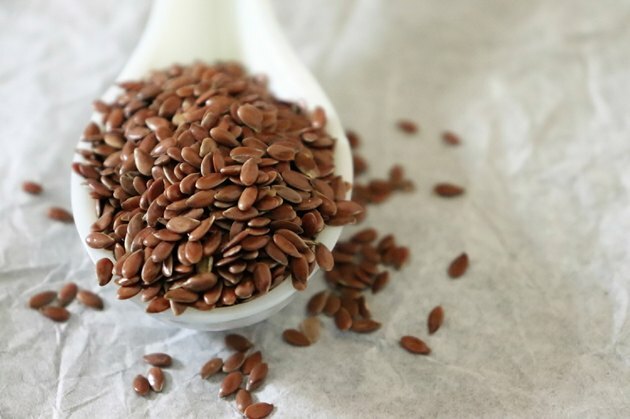 Animal studies (like the ones mentioned in a 2018 review from Frontiers in Nutrition) have shown that components of flaxseed can reduce tumor size and inhibit the growth of ER-positive and ER-negative breast cancer cells. And the same review (which also included human trials), found foods that contain lignan, such as flaxseed, may also help decrease breast cancer risk. Although incorporating small amounts of flaxseed into a healthy diet is encouraged, inadequate human research is available to recommend large amounts of flaxseed, or flaxseed supplements, as a therapy for breast cancer. Ideally, you should speak with your oncologist and dietitian to obtain personalized dietary recommendations. If you're actively going through chemotherapy, for instance, nausea and other side effects my temporarily impair your ability to eat an optimal diet. You may also need to modify your diet to help manage any other health conditions, such as diabetes or kidney disease. Because there are several types of breast cancer and the information about an optimal diet for survivors is evolving, seek the most up-to-date nutrition recommendations from your cancer team. What Are the Health Benefits of Cottage Cheese & Flaxseed Oil?